In a study released on Nature Climate Change's website today, scientists draw from recent findings to underscore the multifaceted dynamics of surface melting in Antarctica. The study authors come from Columbia University's Lamont-Doherty Earth Observatory, the Cooperative Institute for Research in Environmental Sciences at the University of Colorado Boulder, and Rowan University. Antarctica is often thought of as a cold, high, and dry place—and these are all certainly true of Earth's largest ice sheet, which currently locks away about 58 meters of sea level rise. However, recent studies indicate that in a warming future, more of the surface of the Antarctic ice sheet will melt. Whether this new water collects in lakes, moves in rivers or is absorbed in the near surface snow like a sponge, has tremendous consequences for rising sea levels around the globe. Today, Antarctica loses most of its ice mass by melting bottom-up from the ocean, and from the breaking off of icebergs. But recent research increasingly indicates that it may not always be this way. As global temperatures continue to rise, Antarctica may progressively face top-down ice loss, too, because of a warming atmosphere. In fact, recent modeling work has shown that it may actually be a warmer atmosphere that drives Antarctica's main contributions to sea level rise over this century. This modeling work has been augmented by observations in recent decades in the Antarctic Peninsula region, where several ice shelves have broken up due to warmer air causing more surface melting. This melting has formed large meltwater lakes that have caused ice shelves to fracture and break up. Once this breakup occurs, ice from inland Antarctica accelerates into the ocean. However, in our ever-evolving understanding of meltwater production in Antarctica, the authors also demonstrate that a warming atmosphere is but one consideration; local-scale winds and feedbacks can be even more important for driving melting. For example, this warmer atmosphere may lead to more snowfall, which, perhaps counterintuitively, could also suppress melting, while at the same time creating more of a sponge-like firn layer to absorb meltwater. Understanding what happens to the meltwater after it has formed is a critical issue that needs to be addressed. Science have gained some insight from Greenland, where there's much greater surface melting occurring today. For example, in Greenland, we know that meltwater can seep down through snow and firn into the subsurface, forming vast firn aquifers. If such features begin to form on Antarctica's ice shelves, they could threaten future ice-shelf stability. However, Antarctica's ice shelves are not the only thing that we should be concerned about in the future. 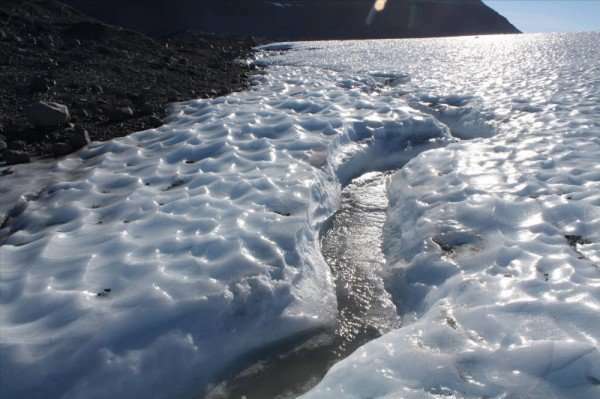 If there's sufficient surface melting on Antarctica's grounded ice, some of this water could make it to the ice sheet base and affect the ice's flow into the ocean, as it is already doing under much of the Greenland Ice Sheet. Ultimately, the authors argue that solving how Antarctica is going to respond to climate change is an increasingly complex task and has created new questions and an urgent need for a concerted, multidisciplinary, and international effort. They write that observations are needed today from the ground and space, and it is imperative that ice sheet and climate models are able to represent the diverse processes affecting melting and hydrology in Antarctica. Because of Antarctica's potential to vastly alter global sea level, these are pressing concerns that require heightened scientific focus.